To exploit the photoluminescent behavior of CdS at nanoscale with different doping concentration of europium—a rare earth element, we report the synthesis of Eu-doped CdS nanorods by using low temperature solvothermal process by using ethylenediamine. The outcomes can have future applications as phosphors, photovoltaic cells, lasers, light emitting diodes, bio-imaging, and sensors. The doping was confirmed by electron dispersive spectroscopy supported by X-ray diffraction. From scanning electron microscopy and transmission electron microscopy analysis it was observed that the average diameter of the Cd1−x Eu x S nanorods is about 10–12 nm having lengths in the range of 50–100 nm. UV–Visible spectroscopy study was carried out to determine the band gap of the nanorods and the absorbance peaks showed blue shift with respect to the bulk CdS. The blue shift was also observed as the doping concentration of Eu increases. From photoluminescence (PL) studies at λex = 450 nm, peaks at 528 and 540 nm were observed due to CdS, peak at 570 nm is due to defects related transitions, while the peak at 613 nm is due to Eu. As the doping concentration of Eu is increased the intensity of the luminescent peak at 613 nm is increased. Thermogravimetric analysis showed the nanorods are thermally stable up to 300 °C. 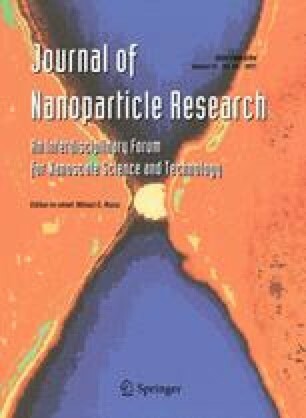 The traces of impurities adsorbed on the nanorods were confirmed by Fourier transform infrared spectroscopy. This study is supported by Department of Science and Technology (DST) (sanction order no. SR/S2/CMP-02/201 2005). The authors are grateful to DST for its generous funding.